To preserve or restore rivers at a catchment or basin scale, an action plan must be defined to identify and organize actions to be implemented. SBMPs or “SAGE” are a local version of the RBMP, intended to address issues specific to each territory. It’s a planning instrument that sets, coordinates and prioritises overall objectives concerning the use and protection of water resources and aquatic ecosystems, and the preservation of wetlands. Operational implementation of the SBMP requires appointing managers and funding studies and projects. That may include signing local or regional environmental contracts, and establishing voluntary and negotiated action programmes requiring financial commitments over several years on the part of the participants. Territorial contracts can also be used at catchment scale. A restoration project will result in profound environmental modifications that will disturb the relations that local inhabitants and people familiar with the area have developed over time with the river and its territory. Local or regional environmental contracts or “contrats de milieu” (river, lake, aquifer, bay...) are concerted and voluntary action programs implementing RBMP objectives. These are multi-year financial commitments between stakeholders involved in coordinated and sustainable water management at catchment area level. 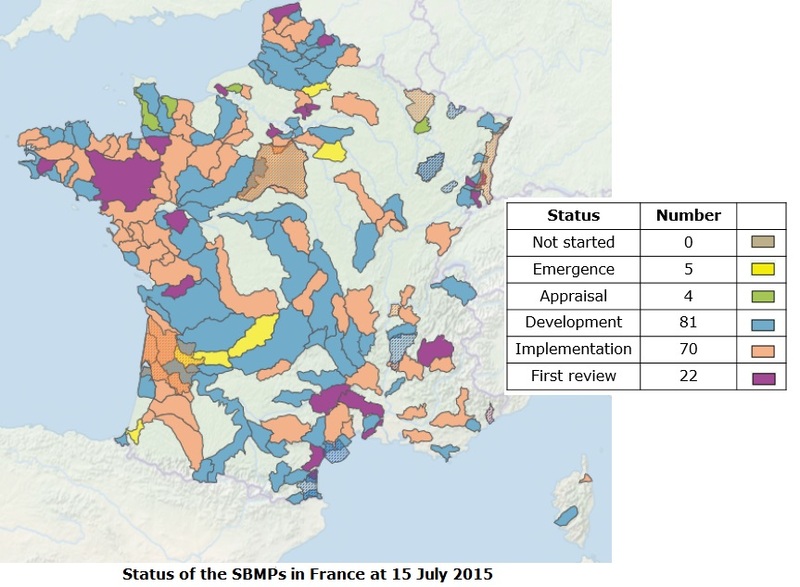 A map presenting the progress of existing contracts in France is available on the Gest’eau website. Within the context of management of aquatic ecosystems, ecological engineering, which may be defined as environmental management through the design of sustainable, adaptive and multi-functional systems, based on the natural mechanisms governing ecological systems, stands out as an important concept. Documentation on action plans and ecological engineering is available. This publication presents the key concepts and the benefits of ecological engineering, and gives feedbacks for all stakeholders involved in the management of aquatic ecosystems. An english summary of this book has also been written. Gaié (Ecosystem engineering group) and Onema examined the position of ecological engineering in sustainable water management during a symposium organized in Paris on 13-14 December 2011.